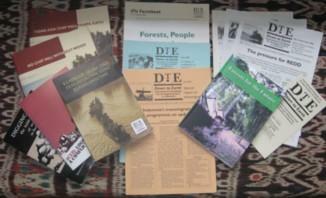 On 8 February 2011, DTE joined 140 participants who gathered in London for the ninth Rights and Resources Initiative (RRI) Dialogue on Forests, Governance and Climate Change. By Pang Yuriun, Coordinator of Aceh's Indigenous Peoples' Network (JKMA). Accepting REDD (Reducing Emissions from Deforestation and Forest Degradation) schemes as a necessary means to combat global warming bears a series of consequences for all of us. First, measures undertaken under the REDD mechanism need to be an integral part of an overall strategy to combat illegal logging and reduce the rate of forest destruction and degradation. In August, Indonesia's National Climate Change Council (DNPI) announced the results of a draft study which includes a series of projections for greenhouse gas (GHG) emissions reductions and compares these with 'business as usual' scenarios.